Our theme for this week at the Year of Jewelry is Circles, Squares, Triangles and I found this great bangle with a square bezel to inspire me. 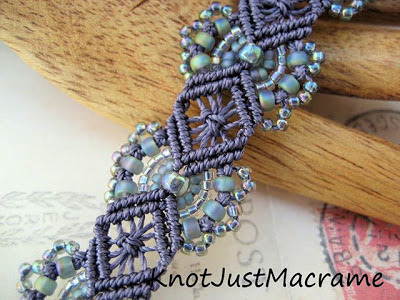 I used Superlon MICRO bead cord to make an itty bitty piece of macrame, and believe me, keeping that tiny stuff straight is a challenge. I used 42 cords to make this piece and it's slightly under 1.5". 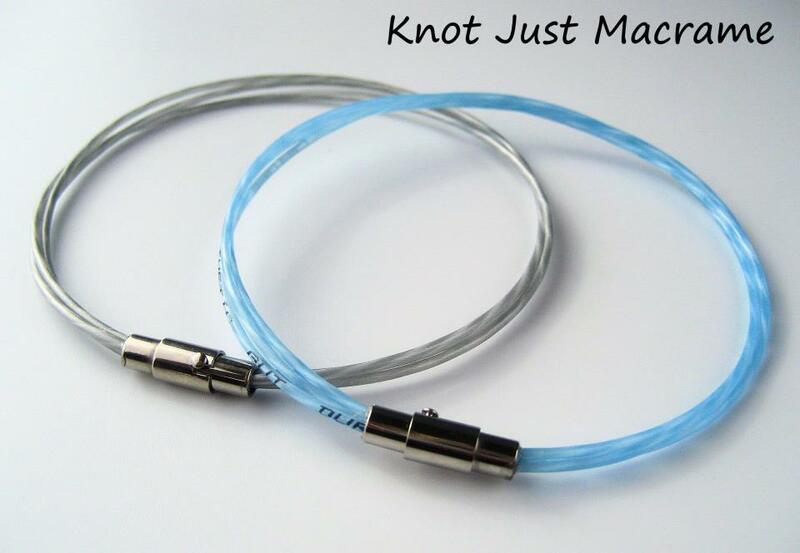 The first spool in turquoise is the S-lon Micro Bead Cord. It has a diameter of .115mm and there are 287 yards on that spool. The next spool in blue is Superlon (or S-lon) Fine Bead Cord. 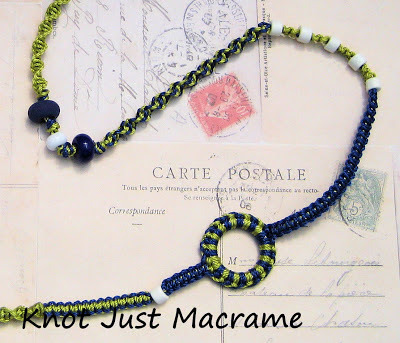 It's somewhere between the Micro and the plain old bead cord and has 118 yards on a spool. The lilac colored cord spool is the stuff just called Bead Cord (no micro or fine in the title). This is the weight that I usually use for micro macrame. It's .5mm and there are 77 yards on that spool. The last spool in chartreuse is the Superlon Tex 400 cord. It's .9mm and comes in a 35 yard spool. The bead cord was the first weight introduced and is available in the most colors. It will go through most 11/0 seed beads once (as long as you are using quality seed beads like Miyuki or Toho). The weight and size are really nice for the jewelry pieces I usually make. The heavier Tex 400 cord is almost twice the thickness of the regular stuff. 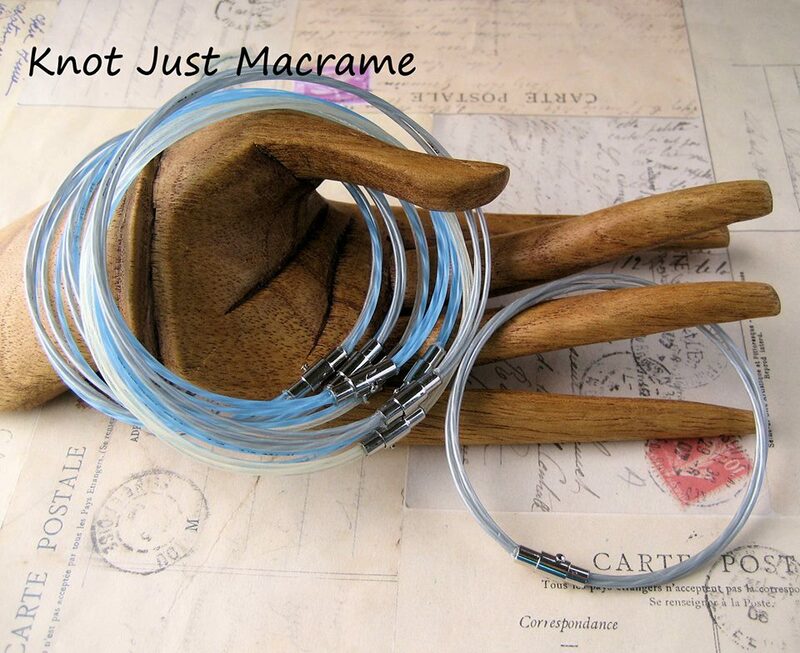 It works well for pieces like multi strand necklaces and for bigger, chunkier pieces. 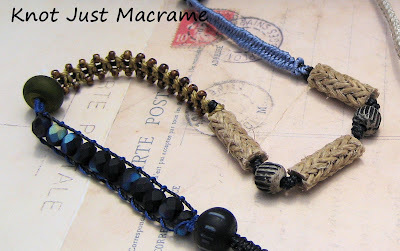 Fine bead cord isn't that much smaller than the regular bead cord, but it feels very different in finished pieces. 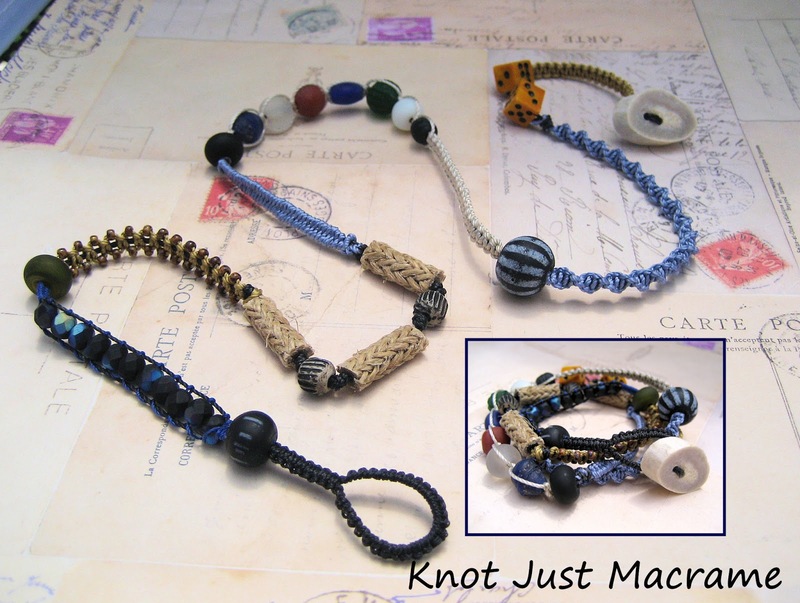 Bracelets made with this cord are more flexible and feel more "slinky", if that makes any sense. Micro cord is almost like thread. It is really small. I can't imagine trying to knot a whole piece using this weight of cord, but it is excellent for fine detail work and makes awesome focal pieces. 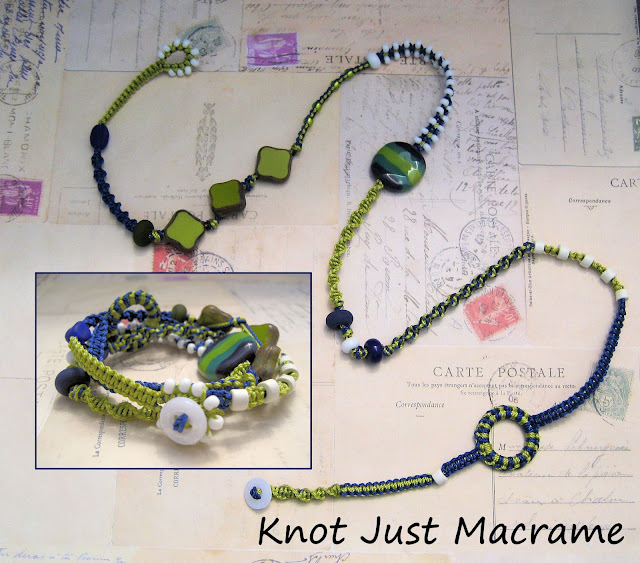 I did the same pattern for the pieces in the next photo, but used Tex 400 for the ecru colored one, regular bead cord for the one in purples and micro cord for the little piece. There. 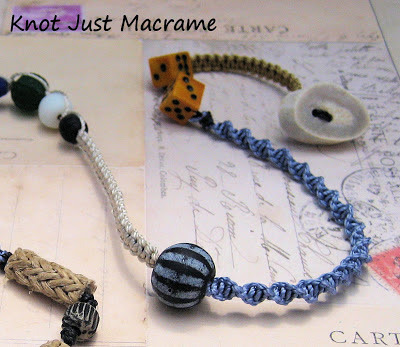 Now you're an expert on bead cord and you can better appreciate the fact that the macrame piece on this bangle is 1" square. The theme for Week 21 of the Year of Jewelry was Cuffs for All. 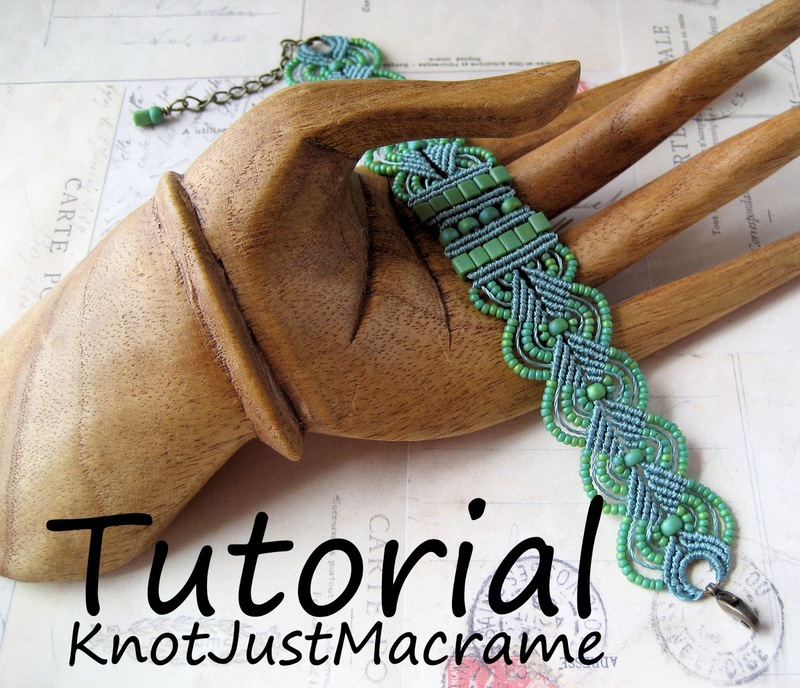 I had difficulty coming up with a macrame piece without a closure/clasp, so my take on a cuff? A bracelet that fits like a cuff. I've been making some pieces use the Superlon fine bead cord - it's almost half the size of the cord I usually work with, which is pretty tiny. 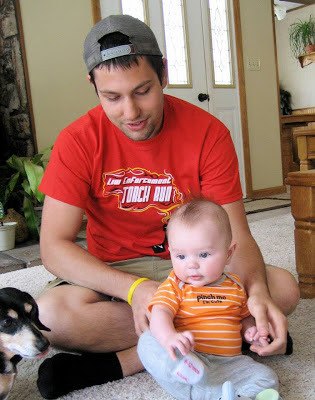 It does, however, allow me to use more cords in my designs without the resulting piece being too big and clunky. I made this design by adding a couple of cords running through the center of my zigzag bracelet and I really like the effect. I am loving the color combination, too. 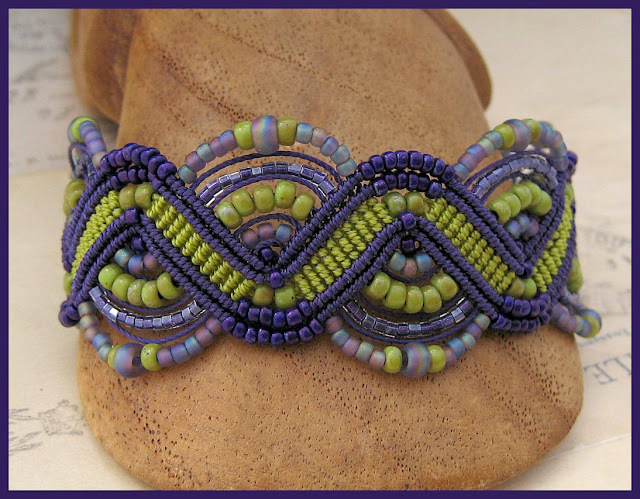 I love to pair chartreuse with different things, but this green and purple is a classic. I did do another bracelet in this design my usual size bead cord. How's this for some summery color? Yes, I've been a busy bee. And I still have lots more ideas, so stay tuned! 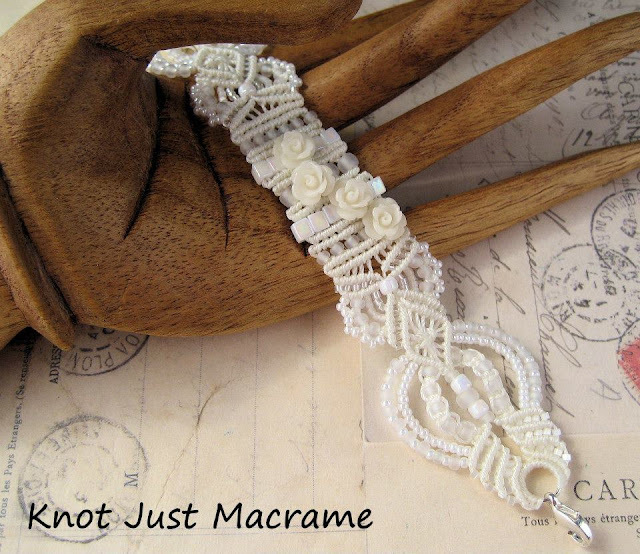 I had June brides in mind when I made this bracelet. It's knotted in white superlon bead cord and accented with white Toho seed beads in different finishes and sizes. The cascade of lucite roses puts it over the top, I think. I made a prototype tennis racquet string ankle bracelet for my tennis playing daughter a couple of months ago. Since then she's been wearing it non-stop. She wears it to her morning workouts three days a week and to tennis practice every day after school. She wears it in the shower and through all day tennis tournaments. This baby has been through the wringer! The clasp is magnetic, but also has a twist lock so it is pretty secure. It has come unfastened a couple of times over the weeks, but given what it's gone through, I think that's pretty good! Which took longer than ten minutes *sigh*. But I could have made one in ten minutes, probably, so I'm counting it. Week 20 - Done! The "assignment" for this week in the Year of Jewelry was to make something in one of the Patone colors for 2013. I chose Vivacious, a bright shade of fuchsia which is part of the Pantone Fall 2013 Color Report. I wanted to do some ombre shading, so I chose the cord range in the photo above. So far, so good. Oh, and the "failure" piece? You don't have to worry about him any more - he found a home with a lady who has a 5.25" wrist. All's well that ends well.